Pax is one of the great untold stories of the industry. It came close to being the game, the game that got it all right and would be the benchmark for all others to be measured against. It blended a superb planetary engine, a good economic model, great ship design, some trade, diplomacy and spycraft, tactical combat, research, you name it. Even with all these facets the game was still easily playable due to its simple windowed interface. And yet today, the game remains pretty largely unknown, at least the original Mac version. A slew of never-fixed memory leaks doomed it, with players giving up in frustration on a game you could tell was amazing if it just didn’t crash. After Pax was released the designers moved on to form their own company, Heliotrope Studios. There they started a sequel to Pax, Eminent Domain, that was supposed to run on both the Mac and Windows platforms. First it was late, then it was later, and then it was really late. After four years when it looked like the game was finally getting ready to ship in ’97, word came down that it was going back into the shop to change the graphics to appeal to the new standard for game interfaces (uh–oh) and that in order to get it out on time it would be Windows only. 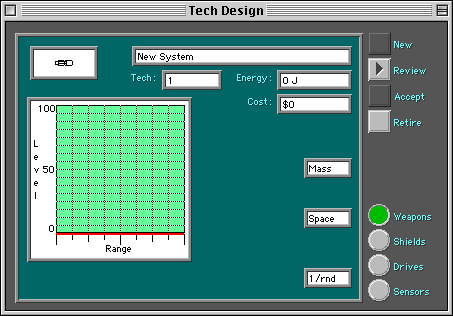 When it finally shipped in ’98, Pax II, the interface was indeed gee–wiz, but at the same time it was harder to learn because it was no longer based on the OS’s own GUI. It also removed many of the features from the original that made it unique. For instance the map was now connected by “wormholes” meaning that you could only travel from system to system, thus removing one of the cool things from the original where you could fly to any point. On the other hand they did manage to get species design down cold. It’s amazing how much Pax got right on the first try. It had almost all of the elements of later space exploration games, it still has one of the strongest tech and ship design systems, as good or better than anything since. In basic terms its only real weakness was its manual, which left you with more questions than answers. Had the game been released in the last couple of years this would have been largely offset by the ‘net, where the player community could fill in the holes. The interface really set Pax in a league of it’s own. It simply can’t be beat in terms of ease of use or the quality of the graphics. They didn’t put in gizmoish 3D effects, movies or other garbage — this is the Mac interface in a game. A little cleanup in terms of window handling and this would still be the game to beat. But then there’s the crashes. The long and short of it is that this game is almost unplayable on contemporary Macs. Any time you played it, if you wait long enough, it would crash. On smaller machines this happened pretty much right off the bat. Under emulation, or machines from the 2000’s with oodles of memory, no problem, but in 1993 the average Mac came with 2 MB of RAM, crash-ola. How it was allowed to be released in that state is a mystery. There were two minor upgrades (to 1.02), but the promised bug fixer release v1.2 never materialized. That was the killer. For all it’s good points, the game simply fell flat because of the bugs. Pax didn’t bother with little details like a plotline or lead–in story. Like so many other games in the genre, you are invited to simply jump in a play with a minimum of pretext. That would have been fine if not for the complex setup system. They say a picture is worth a thousand words. In this case it was literally true, my first attempt to describe the game setup ran on for over two pages! I don’t like referring to pictures but in this case I have to. The large map on the left of the setup dialog allowed you to select the basics of the game map. Clicking on a point in the picture of the galaxy selected the density of stars for the game — high if you clicked near the center, low on the outside or between the arms. When you clicked, the map zoomed in to a smaller sub-map with that contained a random number of stars with that basic density. 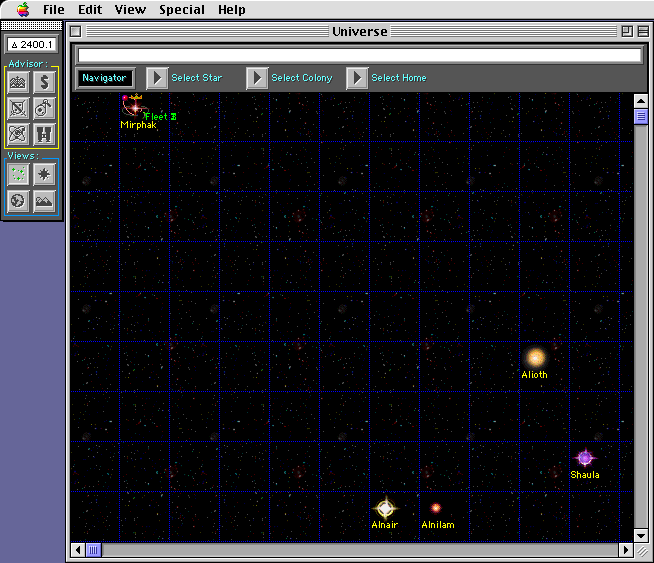 You could then select the game map by dragging over a number of stars to select them, the maximum size of the was limited only by memory. The skill level pop–up near the top ganged settings for Beginner, Intermediate, Advanced and Expert levels. 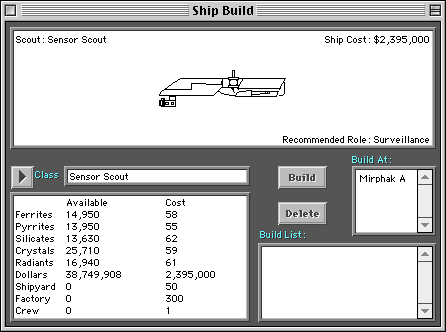 Increasing the skill level started you with less resources and ships, and it turned on several of the other option buttons seen in the setup dialog. This bit of UI always struck me as rather odd; some of these could be selected on their own, like whether or not you wanted advisors, but others were wired in, like the sizes of planets. I always thought the pop–up should only change the starting conditions and everything else should be selectable. Every level but Beginner required you to design your race, and each empire’s race had a preferred atmosphere and temperature. Settling planets other than preferred ones effected the efficiency of your people on that planet, which slowed down mining and building (I don’t know if it also changed things like loyalty, quality of life, or population limits). The level also controlled a number of other specific gameplay items. At lower levels much of the game was run for you, all you had to do was build infrastructure on your planets, build ships, and take over systems. At higher levels the rest of the empire was run via advisors, who you had to choose from a pool of candidates with varying qualities. As the level increased you also took over more of the task of designing your fleets, first designing individual ships, and at higher levels even the systems that you put on the ships. Another change is that the planets themselves grew to include several “areas”, in beginner they had only one area, but at higher levels you could have 2×2 or 3×3 planets. Multi–area planets had advantages and disadvantages and took more time to run effectively. It’s also worth noting that the game allowed a mix of up to 16 computer or human players in the same game. That might not seem like many in the days of thousands of players online, but considering this was released in ’93 it’s pretty impressive. Sadly the human players had to share a single machine taking turns at the keyboard, and that gets old fast. Another interesting option was that the game could be run in either real time or turn based modes, a turn being one year. This was in contrast to most games of the genre, which are either turn–based or real–time. I can’t think of any other game that allows the user to select the time flow like this. 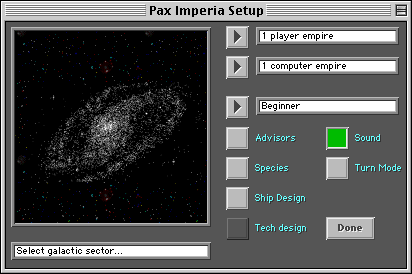 Pax also included the concept of player types based on goals, although this didn’t have any effect on gameplay itself (unlike Starweb, where different player types had different abilities and commands). Every empire gained “victory points” in one of four areas for their development level in that area, these were then added together to create an overall score for the empire. 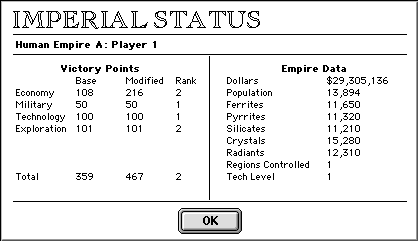 An Economic score was based on the level of infrastructure on your planets, and the amount of money and resources on hand. A Military score was calculated by looking at the number of ships and the tech level of the systems installed on them (but not combat history, odd). A Technological score was based on your average tech level in the base sciences. Exploration was based on the amount of land you controlled. Selecting a goal (called Play Style in the game) doubled the score in one of these selected groups, boosting your overall score. 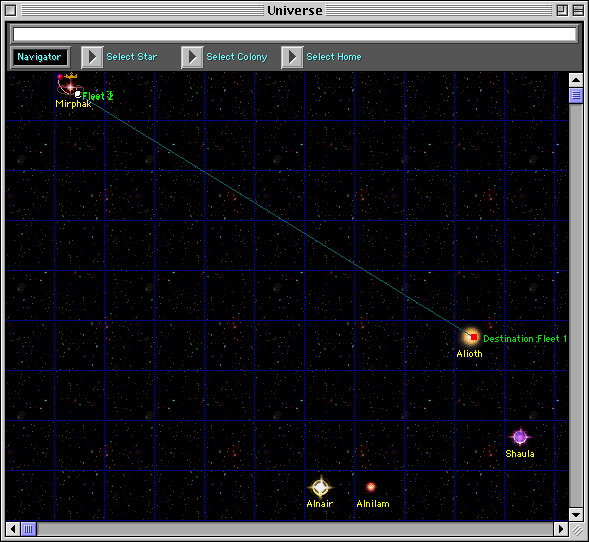 After selecting various options for startup, the main screen appears, representing the Universe. 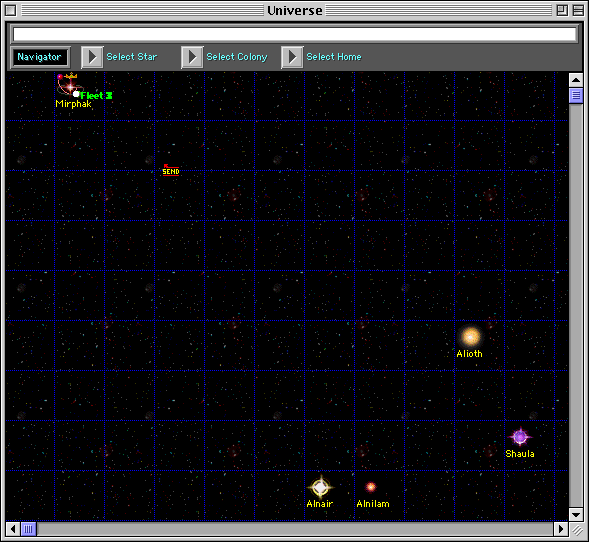 This is in the form of a screen–filling scrollable window displaying the various star systems in nearby space. Stars would appear as a “star” icon (one of many generic but nice icons) until you explored them, at which point they were replaced with the “system” icon. The universe window started out centered on your own star system, and the size of the window depended on how large the map was when you selected the stars during setup. The map was also divided up into sectors with a grid, although this was just for visual effect. Double clicking on an explored system would bring up a new window, where you could see the planets in the system. There were options to see additional information as well, including things like the orbits of the planets, any fleets in the system, and the temperate zone around the star where the temperature of a planet would be right for your species. Like most empire building games, Pax starts with your empire consisting of a single planet in the middle of the temperate zone. Unlike many games the planets were moving, which gave it that added touch of realism. Double clicking on a planet in the system zoomed into a new window displaying the planet and its moons. Due to the way the temperate zones worked there was rarely more than one or two planets in the temperate zone for you to land on, so moons of your main planet were often important in the early game as cheap places to start mining colonies. It was never clear to me if there was any real difference between moons and planets. Although moons were typically smaller than the planets they orbit, in lower skill levels this difference would be hidden because all of them had one area anyway. Other than that there seemed to be no advantage or disadvantage to moons vs. planets. Double clicking on the planet or the moon in this view opened yet another window. This window showed the surface of the planet, and any structures on it. As mentioned earlier the surface could be divided into areas in higher skill levels, each area being essentially its own little planet. Smaller planets and most moons typically had only one area, but larger planets could have more all the way up to 9 in the largest 3×3 worlds. Landing in any one area would produce population that would spread to the other areas, so large planets had the advantage of providing much more resources for the same amount of landed people. As you might imagine, with all of these different views in different windows, the screen tended to get cluttered. An option that allowed you to open one view while closing its parent would have been nice, as well as an option to close a window and return to its parent. 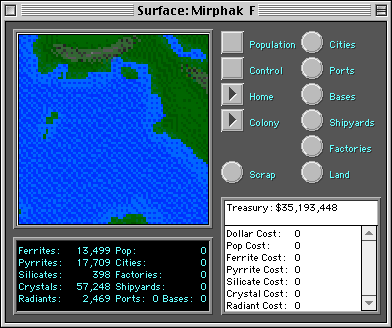 The economy engine of Pax was strong, but like most 4X games the empire’s economy was driven via taxation and mineral wealth. Planets cost a certain amount to run based on its suitability for your race, and this continued to be an expense throughout the game. Population generated taxation money, but only if the planet had been turned into a “home planet”, which happens when you build a spaceport on the surface. Raw materials came in no less than five different types, which seemed somewhat arbitrary considering that most planets have relative amounts of each that are roughly similar. Quick exploitation of those materials is a requirement for a successful game, because once you get going there won’t be any left. The resources are collected by building a Factory in an area. Factories were actually more like mines and factories combined, you needed them to start collecting resources as well as to build ships. You can build more than one in an area to speed up the process — although I never saw the need. Building a factory requires at least 1000 people in the area, this sort of “minimum population” concept is used throughout the game. Other examples of infrastructure include cities, which allow for more people to be supported in an area (and thus raise the tax base) as well as increasing its efficiency. Bases are used for defense against attacks from the enemy ships, as well as increasing the ability of the area to fend off a “migration war”. Shipyards are obvious enough, with the exception that you can only build one on a planet that already has a port (fair enough). The final type of infrastructure is the Port. Building a port turns your planet into a home world, at which point you can start collecting taxes. Of course this implies that you want to smack a port down in at least one area per world as soon as possible, and it only needs 5000 people to support, it so that happens quickly. The manual suggests that it’s sometimes advantageous to leave a planet as a colony and never build a port on it, but I’ve never seen any logic to this and the manual certainly doesn’t explain itself. When building infrastructure the amount of population needed for that building is essentially “used up”, and seems to disappear from the area. In reality it’s still there as far as the tax base is concerned, and I always found this system to be rather odd. It would have been more logical to say that the population in an area represents the amount of people free for work, while the amounts used up are involved in maintaining the existing infrastructure. As the population increases the production levels go up, and they tend to mine the planets clean really quickly. That’s the main reason why I found building more than one factory to be a waste, you’re better off with that extra population for a port, and you’ll gather all the raw materials sooner or later anyway. Once the infrastructure is fully built up, home worlds can be largely ignored. The growth rate of a colony depended on the money spent on it, which is set via an empire–wide spending amount which is divided up among the colonies. This was represented as a “percent of needed”, meaning that if you set this to 50% the colonies were getting half the money they needed and their rates would be slowed down. In some circumstances it was worth it to increase this above 100% to boost the growth rates while taking over planets. After a port was built and the colony became a home world and a different set of spending numbers came into play. The first was the empire–wide tax rate, and in common with most game a high tax rates had negative side effects on your population’s happiness. Home worlds are also the recipients of your empire’s social spending, but unlike the colony spending, increased social spending lowers the growth rate rather than raising it. The description above is almost as long as the description in the manual, specifics of how the economic model worked were left unexplained. Does raising the tax rate effect anything other than the happiness of your people? Does raising the social spending amount offset the annoyance of a high tax rate? I was always left wondering how to control my economy the right way, and invariably met other races who’s tech spending was so much higher than my own that combat with them was suicidal. A similar problem existed in the manuals for MegaWars III, but there the user community helped out a lot and filled in the missing pieces, but for Pax there was no such community to draw on, this was pre–internet for most people. Like all empire building games, the early part of Pax is spent attempting to grab as many good planets as you can as quickly as possible. Since Pax has multi–planet systems along with moons, settlement usually started in your own system. Depending on the game level you’ll have at least a scout ship to start with, so one of the first duties was to send the scout off to the nearest star system to learn about the planets there. After arriving over a planet you could open the surface view and the”land” button would be available. When clicking on this button a list of your orbiting ships would appear, and selecting one of then turned the cursor into a “Land” cursor. At this point you can click an area on the surface of the planet and select one of three missions, Assault, Raid and Land. It used this interface even if there was only one area, which was kind of silly, why click in an area if there’s only one? Assaults are softening up raids who’s primary purpose is to knock out any bases (fortresses) on the planet prior to landing. Raid is also a military mission, but its purpose is to destroy infrastructure on the surface. Both missions also killed off some of the people on the surface, but neither is targetted towards this purpose alone. Landing is accomplished by cargo ships (there are no general purpose ships in Pax) which can carry either 100, 1000 or 10000 colonists. Your ships will offload their colonists even if there are enemies still occupying the area. The only prerequisite is that there is no base in the area, or the cargo ships will be shot down in the process. At this point it’s a free for all, the higher population will eventually win that area. On a multi–area planet strategy in landing becomes important. By landing on the least populated area of a planet you can maximize the number of colonists that survive, increasing your chances of a successful mission. Once the colonists are landed, natural expansion rates will allow the population of that area to increase as if it was its own planet. Depending on the population of that area compared to what it can hold, the colonists will want to move out of their area and into others, and this leads to “migration wars”. When people move out of one area it’s exactly as if they had been landed in the surrounding areas, but this happens with no work on your part. In order for this to work you’ll also need to raid the surrounding areas, or have your race have a very high reproduction rate or aggression. At the same time the population of the surrounding areas is moving into your own areas depending on their own rates, and this is where the suitability of the planet for your race becomes important. Fleet movement was simple. 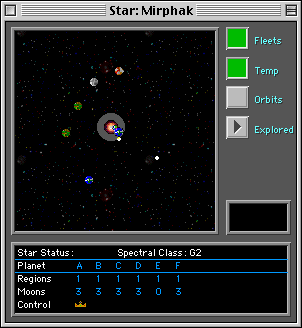 You start by holding down the mouse in any window that contained the fleet, for instance if the fleet was orbiting a star you could select the fleet by clicking in the window showing the planet and its moons, the window showing the whole system, or by clicking in the sector in the main map of the universe. After a second or so a pop–up menu appeared listing all of the fleets in that view, you moved the mouse to select one of the fleets from the pop–up, and let go of the button. Now that fleet is selected the cursor turns into a “Send to” pointer, when you double clicked on another part of any map the fleet would start moving to that location. 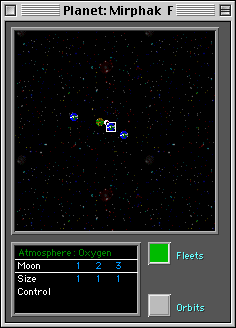 You could even use this across multiple windows, selecting a fleet in the galaxy map, and then sending it to orbit a particular planet in a system view. I found this part of the game to work really well. In Pax the entire map was a potential destination of your ships. When a ship was sent to a system (as opposed to a planet) it would arrive on the outskirts of the system and from there you could see what was going on without approaching any of the planets. You could send your ships on a mission to deep space if you wished, leaving them to spy on a system, and parking your ships between planets was an effective method of inderdiction. Combat was quite advanced and the game included a small tactical engine to allow you to control the outcome more closely. As interesting as it was, it was also very slow and the interface was terrible. I typically gave up in frustration after a few tries, and let the computer decide the outcome for me. One of the more interesting bits of the technology system was that the weapons and sensors have ranges, which could be controlled by the designer. It was possible to tune your designs to your style of play, say standoff ships that plinked the enemy, or perhaps ships that shrugged off damage while running in for the attack. One on one combat meant the better ship won in most situations, but with a fleet you could allow one ship to be kicked around by a better ship while the rest of the ships in the fleet attempted to close in and do damage at close range. In addition the accuracy of each ship was effected by the relative strength of its sensors, as well as the “tac” speeds of the ships. The later is an interesting twist, essentially it says that the better accelerating (maneuvering) ship is less likely to be hit. This makes perfect sense, it’s odd that it hasn’t been used in other games. Thus the combination of multi–ship fleets and a real tactical combat system resulted in fleets of less powerful ships being able to overwhelm ones with better ships. This I consider to be one of the game’s many high points. One the other hand due to the nature of the game you typically didn’t have time to organize fleets, so most consisted of single ships rushed out to the front lines as soon as they were built. Ships were ordered by selecting the ship type and then the planet on which to build it. Once they were completed they would enter orbit and join the first fleet already in orbit above the planet, or make a new one if there wasn’t one. Pax also included a system for controlling the fleets and moving ships from fleet to fleet. Ships were more complex than in most games. They included both “star” (warp) and “tac” (sublight) drives which also doubled as electrical generators for the other systems on the ship. Weapons could do either mass or energy damage, or both, and armor and shields could defend against them. The game also included a complex sensor system which had sensors (radar), anti–sensors and even anti–anti–sensors. At lower levels of the game, new ship designs appeared as soon as specific tech levels were reached, at which point you could build them, typically for a lot of money. Thus in the basic levels it was reasonable to spend equal amounts of money in each of the four basic science areas. In the medium level it was up to you to design the ships, so devoting more to weapons would create new weapons components earlier, which could then be used on new ships. All of the ships were based on one of a number of pre–rolled hull types, the game has no less than 12 separate types of hulls. Even with that many I found it odd that you could design the parts, but not the hulls. Each hull type included a number of connection points where various devices could be attached, allowing you to customize the ships to your own personal style of play. It was a somewhat complex system that could have used a little UI cleanup, but in general the “blueprint” type system seemed to work well. Driving the ship’s capabilities was Pax’s research system. A per–annum spending amount set the rate of progress, which you could devote to four areas, weapons, shields, drives and sensors. Your tech level in any area was used to determine what types of ships you could build, and the cost of the item — simpler items fell in price as your tech level rose. At the highest levels of play you even designed the components themselves. For any given tech level the component could have a maximum power of 100%, from there you could then tune the components by limiting it’s power or accuracy at various ranges. When designing a long range weapon you could limit the accuracy and power at short ranges, and increase them to 100% at long range. The end result is a weapon that is far less expensive than one that’s 100% at all ranges. Given the same sorts of performance tradeoffs, a level 5 weapon will still be more powerful than a level 4 weapon however. This system places Pax in a league of it’s own in terms of depth, but I found the system to be too complex. So complex that I found the level of abstraction was detracting from the gameplay and I ignored it for the most part — sad considering it was potentially one of the game’s best features. A reduction in the number of concepts would have helped enormously. Do we really need to have the difference between star and tac drives? Do we need mass and energy weapons? Wouldn’t it be just as interesting with only one type of armor? And since everything is relative, couldn’t the strengths of the sensors and anti–sensors be enough, was there anything added by having anti–anti–sensors? Somewhere someone needed to say “ok, enough”, but it appears no one did. The last major area of the game was the political system. This had a couple of different aspects, but for the most part the whole system was represented by your advisors. For the most part advisors were really just the primary interface to the global portions of the game. Clicking on the Economic advisor would bring up a dialog allowing you to set the tax rate or colony spending, see the amount of money in the bank, or set the various budgets. Calling up the Research advisor allowed you to set the research budget, or move money from one type of research to another. The Protocol advisor keeps tabs on your other advisors as well as acting as the interface to the other empire’s ambassadors for trade purposes. One other advisor requires a bit of detail, that’s the Espionage advisor. This advisor had two budgets, one for espionage, and another for counterespionage. If the former was high enough you could spend even more and bribe an advisor for another empire, allowing you to see their stats. If you wanted, you could also choose to make an assassination attempt on their advisors. The counterespionage budget protected you from those same events, as long as your budget was higher than the enemy’s, their attempts on your ministers would fail. Interesting as this may seem, as far as I could tell it seemed to have no obvious effect on the game. In theory selecting good advisors was supposed to change the efficiency rates of the various offices, but if that actually happened I could never see any difference. Worse the pool of advisors was very limited and none of them seemed to stand out, they just needed to spend some more time here, and MOO really beat Pax in this regard. In addition I never seemed to have enough money for my espionage budget and my advisors were always getting whacked (although I still couldn’t see any effect on the game). So as a result I always played with them turned off — they were simply annoying. Pax Imperia, the original page at Changeling. Sadly there’s practically nothing there, not even a demo. Pax Imperia II: Eminent Domain is the official page for Pax Imperia II, the site is pretty basic but you can download the demo. The Unofficial Pax Imperia Update. The name says it all this father and son team wrote a patch that seems to have fixed all of the problems with the new MacOS menus, and added color to a number of screens that were previously black and white. I need this game. You understand. You mentioned emulation? Where? I seek! Help! Basilisk II on the Mac is what you’re looking for. I assume similar beasts are available on Windows. I can’t find the installer on any of the Abandonware sites though. I remember playing this game as a kid. I started playing with the biggest area you could start with and the highest number of AI adversaries you could include. The way I played well in the scenario was to boost up my tech research and produce highly sensitive sensors for each of the sensor scouts I built. I’d then build a ton and send them on dummy missions in all directions of the game map. On every AI turn, those ships would see the AI’s movements and keep me abreast of what they were up to.